Coca-Cola has been producing and bottling its beverages in Bellevue for more than 40 years. Each year, the company’s 23-acre facility produces 21 million cases of Coke’s branded beverages—everything from Diet Coke to Dasani—and distributes them throughout Washington, Oregon, Montana, Alaska and Guam. Coca-Cola has worked to transform its Bellevue plant into a model of sustainable practices, succeeding with dramatic results. A three-pronged green initiative focuses on recycling and waste management, water stewardship and energy conservation. It has a recycling rate of 99.07 percent, diverting 10 million pounds of waste from landfills since 2008. Water system upgrades have saved more than 13 million gallons annually since 2008. And energy upgrades, including new lighting and an expanded fleet of hybrid delivery trucks, have dramatically reduced the plant’s carbon footprint. It is now the training site for the company’s West Coast operations and a model for sustainable success for companies across all industries. 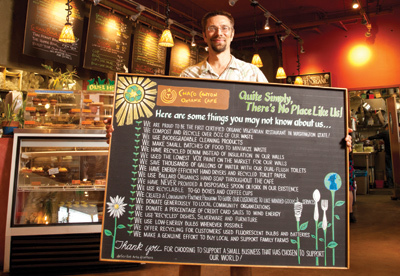 At Chaco Canyon Organic Café, literally no piece of waste goes unnoticed. The café’s staff hand sorts all compost, ensuring that at least 80 percent of waste is diverted from landfills. The company’s two locations—West Seattle and the University District—are the state’s first and only certified organic vegetarian restaurants. Chaco Canyon emphasizes reuse and efficiency over glamour and extravagance. For example, the restaurants don’t provide to-go utensils, urging customers to use their home utensils or borrow some from the business. Pickle jars are repurposed as juice glasses; interiors are finished entirely with recycled wood, most of which came from used pallets. More than 80 percent of the cafés’ lighting is LED or CFL, and customers are welcome to recycle their used batteries, plastic foam or light bulbs at either location. While regular customers tend to come back for the food, the side order of raised consciousness can be just as satisfying.